Ritual Effects is a re-performance of a Jewish museum which investigates intrinsic systems of gender and religion through the repetition, performance, and ritualization of the apparatus of knowledge, culminating in the transgression of knowledge through the same performance that produces them. 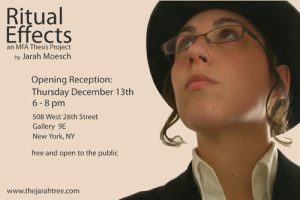 Ritual Effects, explores everyday constructions of identity and gender through the disruption and questioning of visual references and intuitive cultural assumptions from everyday Jewish life. Additionally, the exhibit functions as a museum, where the objects are both actions and performances revolving around post-gendered Jewish space, and question the concept of group identity within the museum/exhibition space. Central to this work is my drag performance. My performances go between ‘male’ and ‘female’; looking at how shifts across binary concepts of gender encompass both one identity and multiple identities within the same body, simply by being in-between the boundaries. Since gender is not absolute, the interpretation of the gendered body is always in flux. Moving between and in-between a multiplicity of genders within the same body becomes a place for exploration. The body becomes the subject, a performance of multiple identities, a way of navigating different geographies.